For 2016, Richard Mille interprets the mechanical writing instrument. 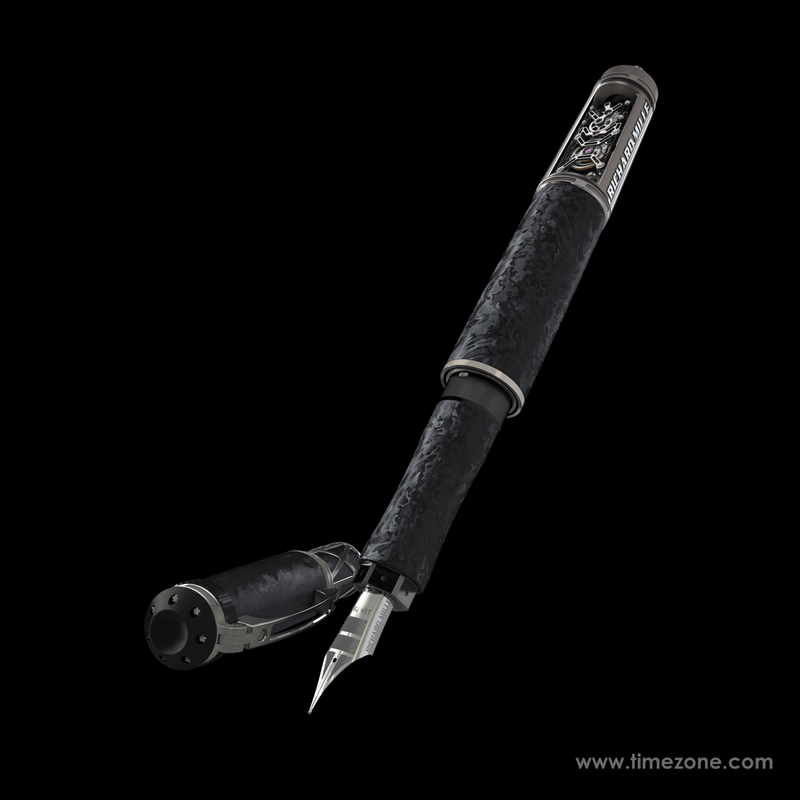 The fountain pen is a symbolic luxury object designed to appeal to the daily or occasional user, the simply curious, the connoisseur and the collector alike. Locked for centuries in an endless cycle of popular or stylistic reinterpretations, it has rediscovered its true worth with Richard Mille. The Swiss brand transforms the pen into a pure product of watchmaking by virtue of a mechanical movement as complex as any RM calibre. The last word in cutting-edge technology and innovation, with a strong artistic angle and optimally ergonomic design, the mechanical fountain pen epitomises the brand's entire philosophy. The pen is equipped with a genuine, manufactured calibre, thus fitting perfectly with the Swiss Jura watchmaker's development and production strategy. It offers those in the know a product that captures the essence of Richard Mille, in the same way as the mechanical titanium cufflinks did. Developed by the brand's movement creators, the pen took almost four years to research and develop before emerging as an exceptional, highly technological, one-of-a-kind product. The movement is based on a skeletonised baseplate and bridges made of grade 5 titanium. This mechanical heart with 12 jewels powers a captivating display of mechanised kinematics that releases the white gold nib. 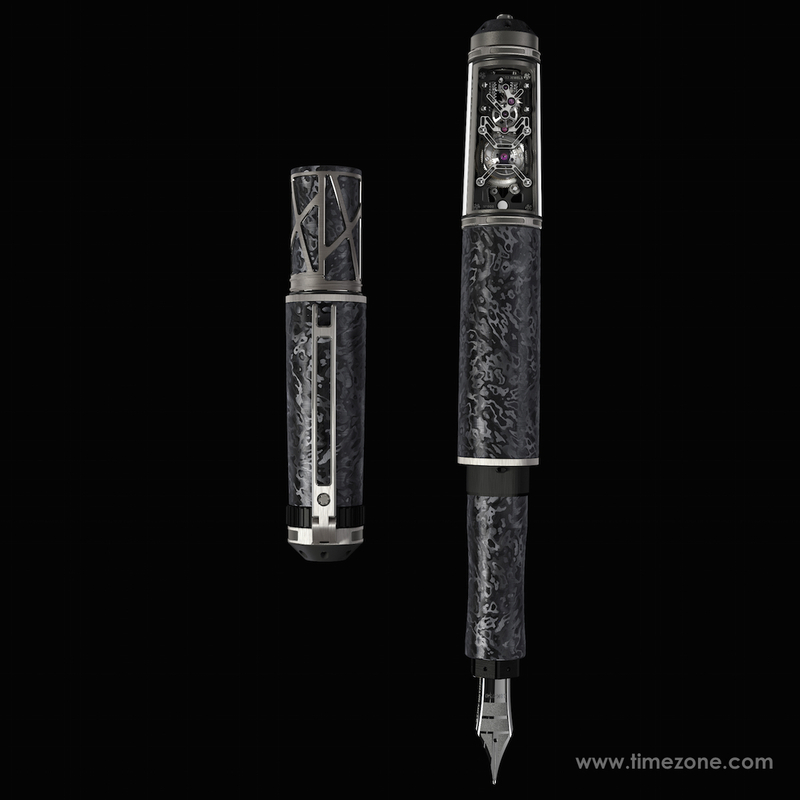 The push-button at the end of the pen triggers the baguette movement fitted with a recoil escapement and a barrel. This escapement, traditionally used in striking watches, releases the head of the nib within seconds in one harmonious mechanical motion. The microblasted and satin-brushed surfaces, the circular-grained and rhodium-plated gears, the hand-polished angles, locking sections and sinks all attest to the care taken with the movement, which is showcased by a sapphire with anti-glare treatment protecting the calibre. Replacing the cap raises the barrel in a fraction of second via a complex mechanism running through the body of the pen. At the very same moment, the nib delicately retracts, ready to emerge again at the merest touch of the push-button. The pen's creators also worked on an ingenious method of removing the nib to insert an ink cartridge without damaging the smooth functioning of the mechanism and the pen. 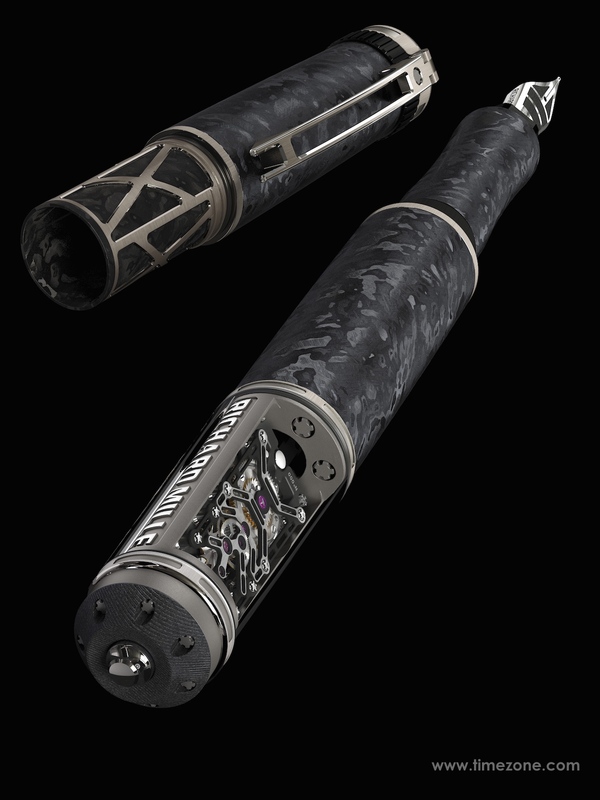 The Richard Mille pen is machined in NTPT Carbon, a material with a distinctive finish obtained by superimposing hundreds of layers of carbon using an automatic deposit system that alters the direction of the fibers by 45° between one layer and the next. Heated to 120° in an autoclave similar to those used in the aeronautics industry, the material is ready to be machined by ProArt, the group's case manufacturer. During this phase, the various NTPT Carbon layers are revealed randomly, making each pen a unique piece. The grade 5 titanium also serves to emphasise the lines of the pen and enables the signature of the Jura-based brand and the serial number to be applied to the movement. By creating this mechanical pen for its clientele, Richard Mille has revisited an emblematic object which, like the brand itself, has transformed its world. The piece is aimed at those who love beautiful handwriting and great Swiss watchmaking mechanisms. Previous Topic: It's good being friends with Mr. Moderator! !